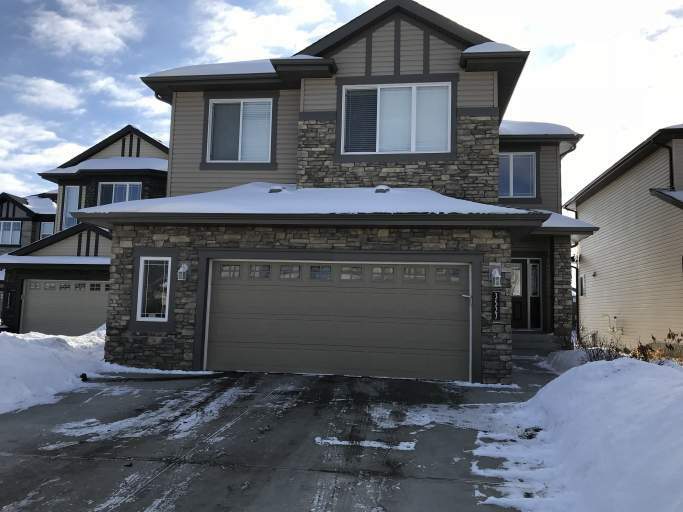 This gorgeous home is located in Creekwood Chappelle which means easy access to Highway 2 and the Anthony Henday Ring Road, making any commute a breeze! You'll love everything this community has to offer! Proximity to Ellerslie Road and James Mowatt Trail means grocery stores, cafes and restaurants are just minute away! With tons of large windows this home is filled with natural light, plus it offers wonderful views, as the home backs onto a large pond and park! Inside the home you'll be greeted with stylish tile and laminate flooring and a wonderful open concept layout. The front entry opens into the massive kitchen which is perfectly designed with beautiful dark cabinetry and plenty of counter space. With to-the-cieling cabinets, a massive island with a breakfast bar hangover, and a large pantry closet, you'll never run out space in this kitchen! Stainless steel appliances including fridge, stove, microwave and dishwasher finish this kitchen perfectly. Off the kitchen there is a large dining area and an incredibly stylish living room featuring a vaulted ceiling and gas fireplace. A large deck overlooks the scenic pond and can accessed through the dining area. A half bathroom and a large mudroom off the double car garage access door finish this amazing main floor. The upstairs level offers a three large bedrooms, the master boasting its own private four-piece bathroom and a large closet. A separate loft area makes for a perfect office or play area! Plus enjoy laundry on the upper level, no more carrying loads of clothes up and down the stairs! The unfinished basement is perfect for storage and provides access to the massive fenced yard. Don't miss out on the amazing gem in Creekwood Chappelle! Call today!